Home 9Mobile Cheap data plan How to Activate "9Mobile Free YouTube Video Streaming" Now ! 9Mobile YouTube video streaming data, offers free video streaming on Youtube for free at night. This Youtube video pack is part of the 9Mobile (etisalat Nigeria) "Video Pak" data bundle under 9Mobile (etisalat ) Smartpak plan. 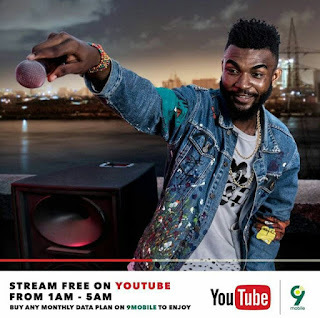 9Mobile free YouTube streaming is different from the Smartpak data plan, its a free offer to all 9Mobile subscribers that activates any of these 9Mobile monthly data plan or bundle. To activate 9Mobile free Youtube Video streaming data, just suscribe to any 9Mobile monthly plan, the free Youtube data will be automatically added to your data bundle. This 9Mobile plan is valid for a month withing the hours of 1am to 5am every day. Although, the free data for YouTube video streaming cannot be checked, most users says its capped at 2GB, so the time it lasts depends on the amout of video you stream. Although this only allows streaming videos on YouTube, you can download with this free youtube data from 9Mobile by using these Anonytun VPN apk settings on your android device.